Clothbound, 9.75 x 13 in. / 152 pgs / 59 tritone. From 1926 until her death in 1954, Mexican painter Frida Kahlo created striking, often shocking, images that reflected her turbulent life. One of four daughters born to a Hungarian-Jewish father and a mother of Spanish and Mexican Indian descent, in the Mexico City suburb of Coyoacn, Kahlo did not originally plan to become an artist. During her convalescence from a bus accident in her late teens, Kahlo began to paint with oils. Her pictures, mostly self-portraits and still-lifes, were deliberately naive, filled with the bright colors and flattened forms of the Mexican folk art she loved. At 21, Kahlo fell in love with the Mexican muralist Diego Rivera; their stormy, passionate relationship survived infidelities, the pressures of Rivera's career, a divorce and remarriage, and Kahlo's poor health. The couple traveled to the United States and France, where Kahlo met luminaries from the worlds of art and politics. She had her first solo exhibition at the Julien Levy Gallery in New York City in 1938 and enjoyed considerable success during the 40s, but her reputation soared posthumously, beginning in the 80s with the publication of numerous books about her work by feminist art historians and others. In the last two decades an explosion of Kahlo-inspired films, plays, calendars, and jewelry has transformed the artist into a veritable cult figure. 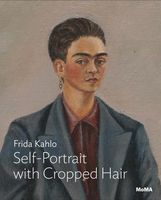 Portraits of an Icon is not another book featuring Kahlo's beloved, tortured self-portraits. Rather, it offers another kind of portrait of the artist, a means of seeing her through the eyes of those who surrounded her: modern masters of the camera such as Edward Weston, Imogen Cunningham, Manuel Alvarez Bravo, and Martin Munkacsi; leading photojournalists such as Giselle Freund, Bernard Silberstein, and Fritz Henle; and Kahlo's relatives, lovers, and friends, among them Guillermo Kahlo, Nicolas Muray, and Lola Alvarez Bravo. The images span Kahlo's life, beginning with a photograph of a self-possessed chubby four-year-old, her fists full of wilting roses, and ending with the image of an emaciated, wasted figure laying on her deathbed, dressed in pre-Columbian finery. They follow the artist's trajectory from precocious child to famous artist, bringing into focus the painter, the paintings, the patient, the wife, the daughter, the lover, the friend. They permit a look into her bedroom, a seat at her table, a visit to her hospital room, a stroll through her garden, a view into her collections, and some play with her pets. While many of these images provide us with a unique opportunity to glimpse the woman behind the facade, others, though less revealing, are equally fascinating in allowing us to view one of the most intriguing of the artist's creations--the construction of a self-image as carefully crafted and conceived as any of her works of art. FORMAT: Clothbound, 9.75 x 13 in. / 152 pgs / 59 tritone.